Chapter 3 is all about length proportions. I did the body proportions exercise last time. Today, I’ll look at balance points for necklines, collars, and jewelry. According to the book, most people have two balance points. Balance points refer to how far down the bodice the neckline, collar, or necklace should go, and they are determined by certain lengths in the face. 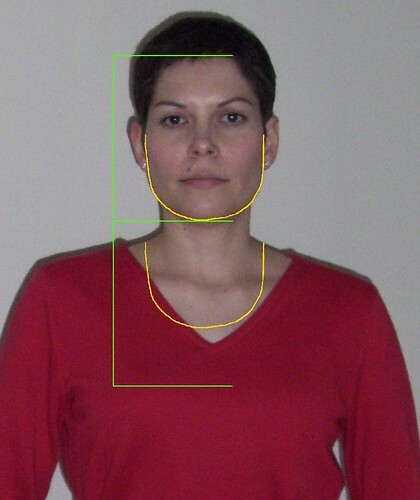 To find your first balance point, measure the distance from your hairline to your chin. You can use a length of ribbon, a string, or a ruler. (I am partial to the ruler.) Then measure the same distance from your chin down. Where it ends, is your first balance point. Mine is shown in green in the picture below; you can see it’s fairly close to the bust level. This could be where a shawl collar crosses, or where the first button on a V-neck cardigan falls. To find your second balance point, imagine a horizontal line across the widest part of your face, then trace (in your mind or on a photo) from it down one side of your face down around your jawline, and up the other side back to the horizontal line. Now move this shape down so that the horizontal line aligns with your shoulder line at the neck. Your second balance point is at the bottom of this shape. Mine is shown in yellow in the picture above; I think it makes a neat everyday scoop neckline and I plan to use it soon. Of course, if your face is widest across the jaw, your second balance point will be higher. If your face is widest across the forehead, your second balance point will be lower, closer to your first balance point. The imaginary horizontal line across the widest part of the face also indicates the minimum width of the best neckline. It’s not necessarily that the neckline should be cut that wide; it can be a construction detail that falls at that width. For instance, collars and lapels can extend out to at least the width of the face, even though the actual opening is close to the neck. Interesting stuff, this. Imagine that the seam line where a turtleneck is attached to the bodice follows the width of the wearer’s face and falls at her second balance point. The wearer could then achieve further harmony by wearing a necklace that falls at her first balance point. Is her neck long, medium, or short? Would you even notice? I’m betting most people wouldn’t, at least not without close scrutiny. Where there is harmony, the natural reaction is to enjoy it, not dissect it. Earlier today, I put on a striped knit top and did the above exercise in front of a mirror, with a ruler. I marked the relevant points on the top with pins (the stripes really helped; if you have a gingham mock-up of a previous project, it might be even better because it would also help with the width) and then transferred the markings to my skin with a washable marker. I happen to have a conveniently located birthmark right at my first balance point, and my second balance point is an inch and a half below a small mole. You may have similar landmarks to help you when you’re trying on muslins or RTW. This chapter had a lot of information. It feels like the kind of chapter where you get a lot of dots and only connect some at the beginning. Then the more you apply the principles, and look for the proportion relationships and balance points, the more dots get connected. I will explore this further with future sewing projects to see if I can connect them all. The next chapter deals with body particulars, symmetry/asymmetry, and whole body side view contours. It should be fun. Thank you so much for these lessons Alexandra. More and more as I age and my body has changed, I realize I should take proportions into consideration. I’m definetly going to try these exercises when I have the time.